I am a novice hunter. So far, I’ve enjoyed a few guided experiences with pheasant hunting, one with ducks, and have been in the woods several times for deer – unfortunately with no venison in my freezer so far. My goal this spring is a Turkey Hunt. In the interest of expanding my horizons, improving my luck, and getting to know a piece of family property better, I decided to invest in a game camera. The problem is that the property I want to put it on is two hours away. I can’t just run up there every week to pull SD cards. So I did some research. Technology is advancing and there are now some cameras on the market which use cell phone technology to send the photos remotely in addition to storing images on an SD card. 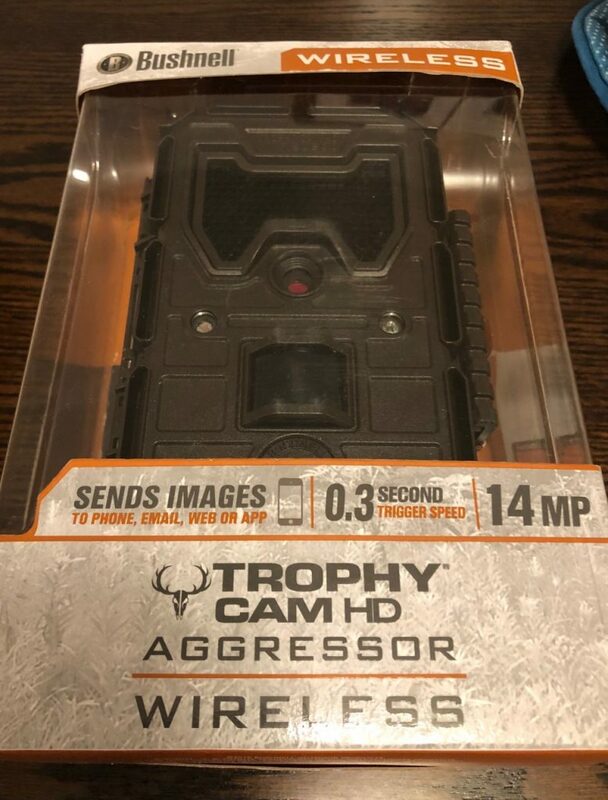 I chose the Bushnell Aggressor Wireless Trophy Cam HD. Though I did see this model at SHOT Show and talk to a rep I decided to buy my first cam with my own pocket change. Being the cheapskate, I mean frugal person that I try to be, I found one “used” from the Amazon Warehouse for about 30 dollars cheaper than new. A trail cam with cellular capability still isn’t “cheap”, but due to the distance involved between where I live and the property in question, it suited my needs much better than a traditional trail camera would. The box arrived from Amazon within a few days. The camera was in its original packaging which had been opened and resealed. It otherwise appeared to be in good shape. The owner’s manual was creased as if opened, but the plastic cling film was still on the interior viewer window and the strap was still factory rolled. Apparently this model was opened but not not actually “used”. Maybe it was a store display model or something – who knows. But since I got it cheaper, I win. 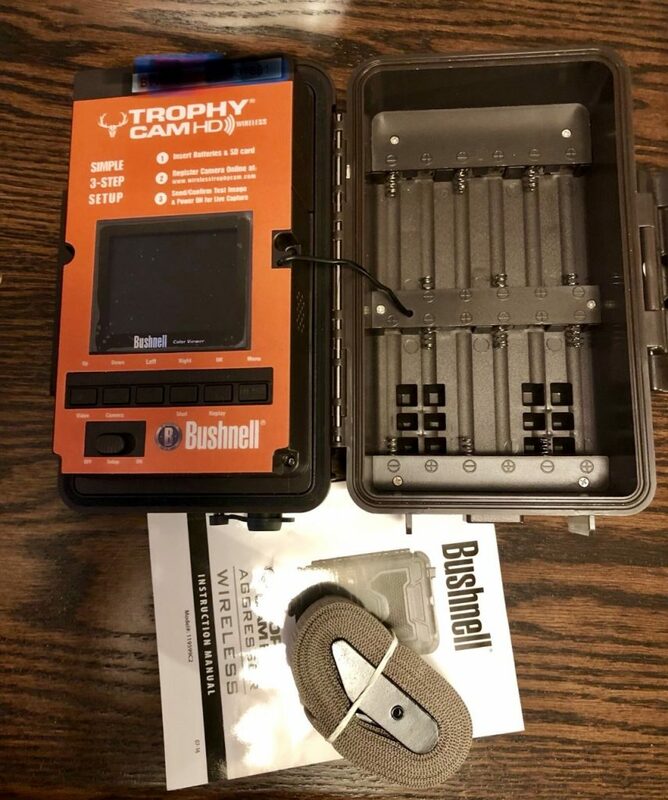 The set-up for the Bushnell Wireless Trophy Cam was much easier than I anticipated. In addition to the owner’s manual there was a “Quick set-up card”, which has very clear concise directions. Set-up required 12 lithium or alkaline batteries and a 32 GB SD card, which I purchased on a quick run to Walmart. The only criticism I have for the camera set-up process is that entering information and choices was a bit awkward. Because I opted for the camera to send images to my email, rather than by text, entering the longish email via the little left/right, up/down arrow keys was a bit tedious. I recommend doing the set-up when you don’t have any other distractions. Still this was at least semi-intuitive. My car Bluetooth set-up was MUCH more exasperating than this. After making sure the camera was running the next step was registering the unit on the Bushnell website – wirelesstrophycam.com. After entering my information and setting up an account on the website, I then entered the serial number of my camera. This was the only hitch in the process. Since my cam was “used”, it was already registered on the Bushnell site. 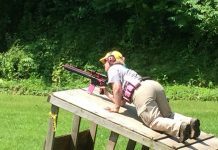 This however was uneventfully resolved by a quick call to the Bushnell customer service line. It took 30 seconds for the rep to reset the number and I was good to go! Once I had an account and registered the serial number I had to give the camera a name. 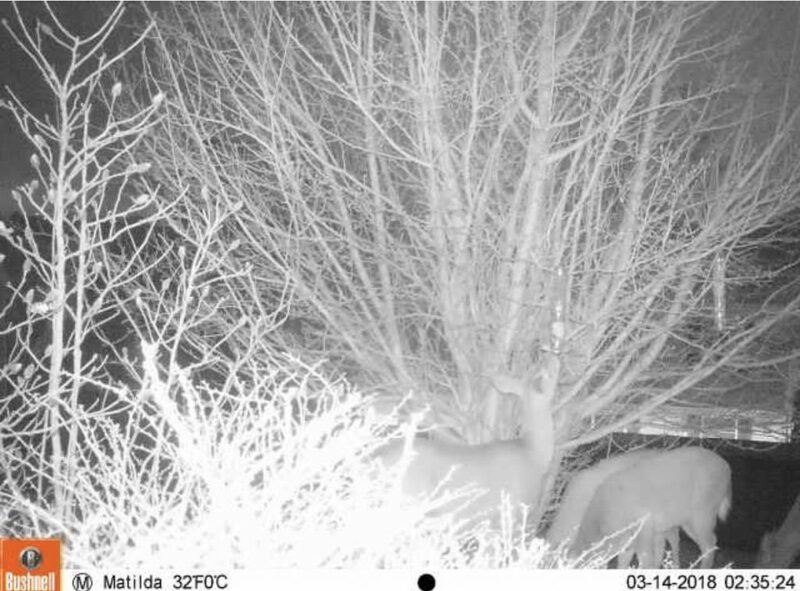 I suppose normal people would name such a camera “back field” or “food plot”. But I just pulled something out of the air to get started. I named it “Matilda”. In retrospect I should have named it “Prince Charming” or “Hot Guy”, because when messages arrive they are labeled with the camera name. Thus my messages would arrive saying “Prince Charming uploaded a new photo”. Hmmmm, I’ll have to go back and see if I can change that setting. Yes, I’m easily entertained! After the camera was registered and named I set up an AT&T data plan for the camera right through the Bushnell website. This is a month-by-month service offered by Bushnell and has nothing to do with my own cell service plan. I happen to already use AT&T but if I had Verizon instead it would make no difference. As long as there is a strong AT&T signal where one chooses to place the camera it matters not what one’s personal carrier is. I chose the option giving me 1500 thumbnail images per month for $9.99, but there are larger packages available. The Field Scan option is interesting but I haven’t used it yet. This feature allows the user to set two times of day when the camera will take several time lapse photos of the area without being triggered. This allows views of a food plot or larger field – to perhaps see game that is too far away to trigger the sensor. I also have not opted to use the video function yet. Video files are too large to upload reasonably. The camera will only record them to the SD card. Since I can’t check the card regularly once I have the camera permanently settled, I haven’t used the video setting. 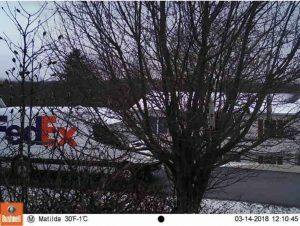 I set up the camera for a one week trial-run on my porch. I wanted to be sure I understood how the whole thing worked before I stationed it two hours away, where I couldn’t easily adjust it. I chose my front porch because there is a crabapple tree in the front yard which is known to be frequented by four-hooved bird feeder thieves. This trial run ended-up being a very a good move because it highlighted a few things I hadn’t taken into account. Lesson One: I initially had the camera mounted too high. 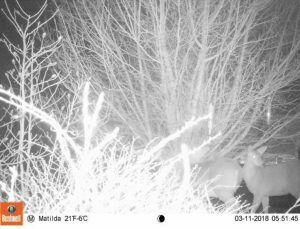 Though it was aimed AT the bird feeder, it only caught feeder thieves whose snouts were actively IN the feeder, not ones which were on all fours closer to the ground. So in the morning I moved the camera lower. 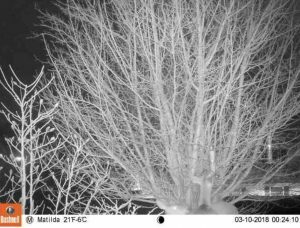 Lesson Two: Random twigs that one barely notices during the day really obscure the camera’s view at night in the IR flash. Lowering the camera put it behind some bush twigs which looked very large and brightly lit. So I got out the clippers and did a little early spring pruning the next morning. Lesson Three: I chose wisely when deciding to have the camera notify me by email rather than text message. I keep my phone on the nightstand due to being on-call. Given the party-hours of the feeder thieves I was quite happy to find out about said party at 7 AM when I checked my mail rather than at 02:35 when it actually happened. Lesson Four: There is a lot more activity in my neighborhood during the day than I had previously realized. Every time I checked my email during the day there were messages from “Matilda” informing me about passing neighborhood cars. She even caught views of the U.S. 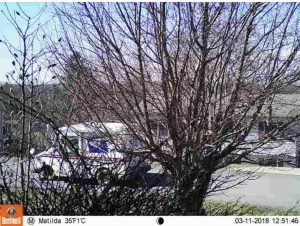 Postal Service in the wild, The Big Brown Truck of Happiness and the FedEx Truck of Dreams. It was like having Gladys Kravitz installed on my front porch. Considering this, I may have to get a second unit and keep it as a security camera! The photos posted here are merely screen captures of what appeared on my email. Higher resolution images are available for purchase from the Wireless Trophy Cam website, or from the SD card in the camera. You’ll notice that photos are stamped with date/time, temperature, and phase of the moon – all useful information to have whether one is tracking wildlife or trespassers of a different species. In addition to being available by either email or text message, the thumbnail photos from the camera are viewable on the Wireless trophy cam website or on the app for either iPhone or Android. The apps are available free of charge in the App Store of your device of choice. The app does not offer quite as many options as the website does but it is still quite useful. The webpage allows you to manage photos, clear the ones you don’t want, order high resolution images, order more air time, add more cameras, check the battery status, and also make some camera adjustments – like sensitivity of sensor, time lag between captures, and night time shutter speed – REMOTELY. No driving up to the site if you decide you want a 3-photo burst instead of one. The camera also notes its own GPS position nightly and uploads that at well so you can see it as a pin on a map. The webpage/app sends a notification if the camera does not “check-in” in this manner. An important thing to note is that if there isn’t a strong enough cell signal where you place the camera it may not transmit properly. Before purchase it might be wise to check the signal strength at the location under consideration. I have also found that if the signal fluctuates and the photo doesn’t upload immediately the camera will send it later when the signal is stronger. I am extremely pleased with the features and function of the Bushnell Aggressor Wireless Trophy Cam HD However the proof in the pudding will be how it operates 2 hours away, and how long the lithium batteries last in the cold. Nonetheless I am excited to see what kind of activity there is on that family property. Now, if it will just stop snowing up there long enough to get this fun new toy installed!